It probably would’ve made more sense for me to review The Deathly Hallows before this one, but that’s okay. The Tales of Beedle the Bard is a companion book written by J.K. Rowling to go along with the Harry Potter novels. 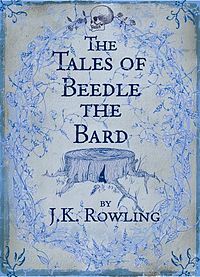 Beedle the Bard is actually talked about in the seventh novel and one of the stories in it (“The Tale of the Three Brothers”) is read out by Hermione. The book contains five wizard fairy tales: “The Wizard and the Hopping Pot”, “The Fountain of Fair Fortune”, “The Warlock’s Hairy Heart”, “Babbitty Rabbitty and her Cackling Stump”, and “The Tale of the Three Brothers”. It’s a bit like Grimm’s Fairy Tales, but instead of Snow White we have Babbitty Rabbitty. Each of these five stories is unique in its own way and, no matter how old you are, it is incredibly entertaining. Beedle isn’t a long book, but that doesn’t mean it’s only for children. Anyone who has enjoyed Harry Potter should read this. Out of the five stories, my favourite has to be “The Tale of the Three Brothers”. From the time it was first read in The Deathly Hallows to reading it as its own separate story, I have always found it to be probably the most interesting. It’s the sort of story you can imagine reading as a child and being totally intrigued by. However, unlike “The Tale of the Three Brothers”, I was not that big of a fan of “The Warlock’s Hairy Heart”. Why? Because it is about exactly what it sounds like: a warlock’s hairy heart. I’m not going to delve into what happens in great detail, you’ll have to read it and decide for yourself what you think. The Tales of Beedle the Bard is a short, fun read that I recommend to anyone who enjoys Harry Potter or who enjoys a good fairy tale (which, let’s face it, who doesn’t?). Have you read The Tales of Beedle the Bard? What did you think? Which story was your favrouite?